Airplanes can represent high hopes for the future, adventure and fun excitement so it’s no wonder that airplane-themed events are a popular choice for a boy’s birthday party. This round-up includes 51 parties that are full of colorful decoration suggestions, birthday cakes, dessert tables, and party favors that are sure to please. We are ready for take-off so please find your seat and fly the friendly skies in search of your next perfect party idea! Don’t miss these 12 Paper Airplanes and Boats ideas that are lots of fun! These Airplane Sugar Cookies are perfect for your next airplane themed party! Get inspired with other modes of transportation with these Thomas the Train Birthday Party Ideas. This rendition of our own collection is done in blues, cream and white. See how to make an easy DIY cloud backdrop for $3 and how to wrap pretzels in map pockets. I think our airplane cupcake wraps are the best! 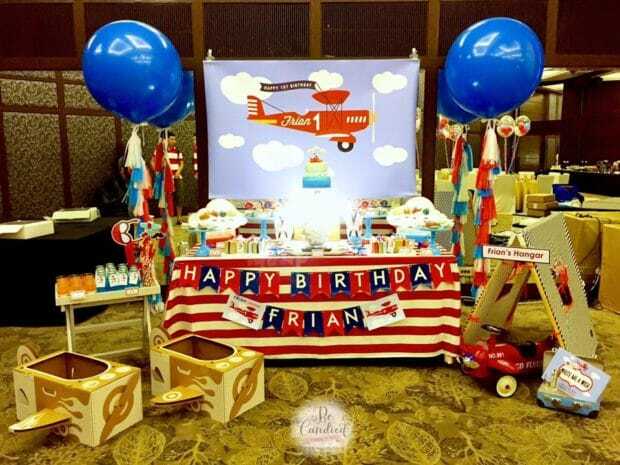 The burlap table cover, vintage suitcases and bomber jackets tie in the vintage setting of this adorable airplane themed birthday party. With sky blue, red and white fluffy clouds serve as accents, the details are what stand out. The serving cart with perfectly wrapped “in flight” goodies served the guest along with immaculately style desserts perfectly summed up the “time flies” theme. 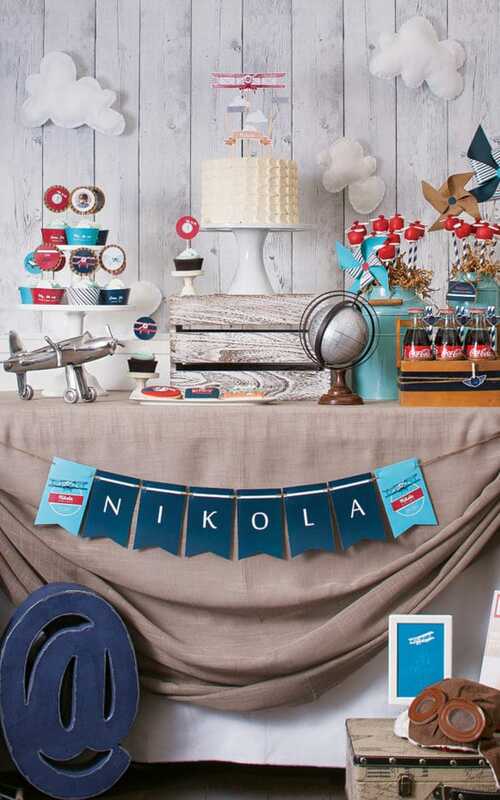 Navy, silver gray, and white are masculine pairings for this stylish plane-themed party. Star accents look good; even the food is blue and white! Ever see a plane exhaust red and white polka dots?! Bright red and baby blue look wonderful in the stripes and dots at this little boy’s first birthday party. The little airplane favors are especially cute, too. This vintage airplane party takes you around the world in style. From the amazingl crafted stacked suitcase cake to the “in flight” prepare meals, the details of this birthday are not to be missed. Guests kept busy at all the stops with a balloon artist, bubble show and even glamour shots. The industrial vibe going on here is a very attractive innovation. Plane schematics make a wonderful backdrop, especially with the chevron arrow inviting, “Fly With Me”. Tan, red and sky blue look so handsome together! Vintage airplanes, maps and hot air balloons are used with great effect for this first birthday event. Quietly stylish, this celebration featured vintage planes, hot air balloons and birds! The menu suggestions will make you wish you were there. This party is full of saturated color! Unique ideas here: a city skyline, a mini air traffic controller prop, and a cupcake runway. Wow! The dessert “table” looks like a candy store! There are lots of details to take in! Blue and orange pop against fresh white. What an adorable cake! Clouds, stripes and stars in red, white and blue look a party waiting to happen! This party is bright and colorful with red and yellow but the darker forest green and tan add richness to the décor. Maps, vintage planes and an awesome cake add to the scene. 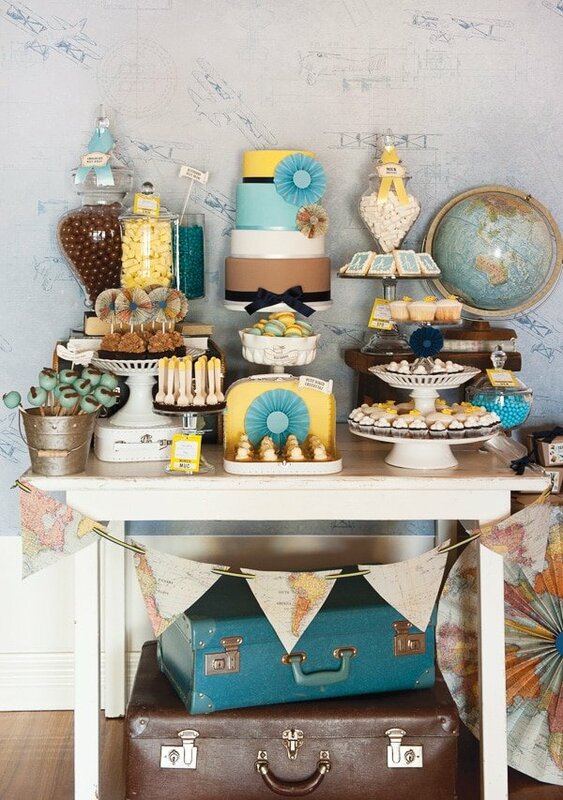 Sky blue, light browns and sunshine yellow make a winning combination for a boy’s plane-themed party. The dessert table is especially sweet with containers full of treats and sweets and mini suitcases setting nearby. There are lots of ideas to see here, including: super-cute cake, candies in the shape of suitcases and pilot hats, and compass favors. Stars and stripes complement this vintage plane theme in red and tan. Cookies, caramel corn, candies, cake pops and Jello pots surround a delightful cake. Sometimes a birthday party is a small affair, just for immediate family. You don’t want to go all out but you do want to celebrate the day. This mom used clipboards to hold clouds and a simple airplane bunting looks great! Tan and red are an unusual color combo for this theme – it looks awesome! A backdrop with vintage-styled aircraft illustrations is terrific. I like the map rosettes and favor boxes, too. Red and blue cheer up any party and this one takes off with all the festive details. Red, navy and grey are guy-friendly colors; the combo looks super on the birthday cake, adorable cake pops and cupcakes. Cereal boxes are morphed into (cute) luggage favor bags plus the invitations are spot-on! The guest table runway is a sweet, themed idea and the entryway already captures attention: look up at the clouds, look down at the runway. This party primarily uses turquoise and red. I especially like the paper plane banner behind the serving table at this celebration. The use of the paper airplanes throughout the party is so much fun! Mini planes top each cupcake and even one in the process of flying tops the cake. Shades of aqua and hits of orange brighten this celebration. Cloud cookies and cloud-topped cupcakes join an airplane cake on the dessert table. Lighthearted and cheery, this is a perfect set-up for a smaller party. The most unique idea here is the vintage plane bookshelf used as the dessert table focal point – it looks super with the sky and cloud backdrop. It’s a darling concept that could be easily replicated. The orange runway guest table looks great! Be sure to check out the food and dessert tables, too. My favorite take away here is the stuffed, white butcher paper clouds – so cute! The take-home favor “luggage” is actually made from a brown paper bag – what a great idea! Shades of blue and orange, with accents of white, look awesome at this outdoor venue where guest seating is covered with cloud-like white awnings. You must see the edible airplane art, too – marvelous! The display cabinet not only looks like it’s ready for birthday cheer, the cake tower, personalized cookies and adorable cupcakes promise that guests will be wowed! This cake is fabulous – and edible! There are many delightful ideas here. 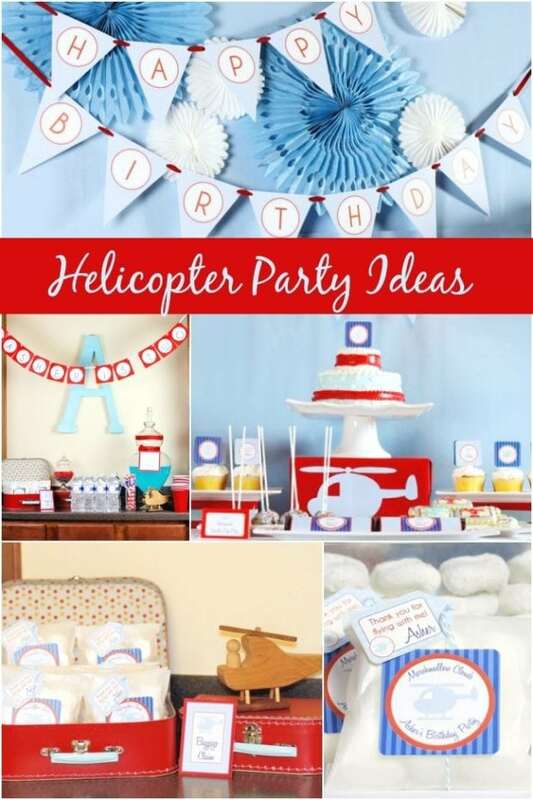 My favorites include the aviator style party hats, sticker covered luggage favors and the DIY airplane cookies. Red, white and navy blue are so handsome for this theme! Clouds made from coffee filters look amazing and Mae has a great way to prepare for a potential craft mess. Sky blue, navy blue and red look great when combined with the stripes and balloons at this celebration. The cake, cookies, cupcakes and cake pops look wonderful and the display ideas are especially winsome. The book page backdrop is an interesting feature, particularly with the use of vintage globes and scales as display vessels. See some hot ideas for table décor and themed treats at this celebration that builds on Disney’s Planes 2. With lots of party décor filling the sky, this charmer offers a bountiful table to delight guests. When a party venue is an aviation museum, decorations are kept to a minimum. Modishly Delish focused on the food and dessert table and offered fabulous fare in khaki, black, grey, and steel blue colors. Aqua, orange and white look fresh against vintage-style maps alluding to the airplane travel theme. The domed cake is especially noteworthy as are the plane and cloud-shaped cookies. Twin cloud topiaries in map-covered pots are my favorite new idea here. The cloud backdrop and cake/cupcake tower are wonderful, too. Here’s another cute blue and orange celebration. Don’t the double balloons look terrific with this theme? The close-up shot of the cake helps you see how darling it is. Almost every detail of this first birthday celebration was handcrafted and it is fantastic! You’ll enjoy looking at this fun, bright event. So many little guys have been inspired by Dusty; moms will be inspired by these very cute and do-able party ideas! With a yellow bi-plane flying overhead, the red and blue dessert table looks most welcoming. Mix up stripes, an old-fashioned Coke crate, a vintage suitcase and vintage style jars with red and white and you’ve got a fabulous look for a little guy’s celebration. High ceilings mean birthday boy and his guests can fly glider planes inside as well as play a fun cargo hold game. Parents watch it all from the Frequent Flyer Lounge. What two-year-old boy wouldn’t enjoy the colorful fun in these decorations? Although adding the parachutes might seem like a natural choice with the airplane theme, it is a rarely seen spin on the party. Sky blue and grass green create a fresh ambiance at this celebration where the balloon photo check-in station is adorable and the “passport” photo booth is full of fun props. Who knew paper airplanes could look sophisticated?! 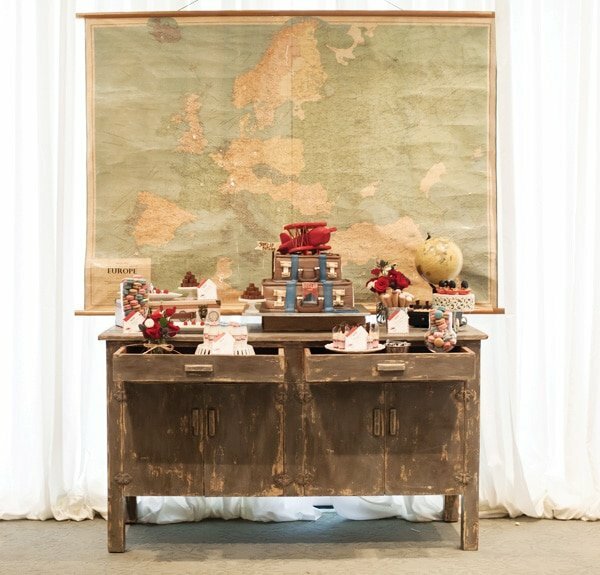 Maps, globes and paper airplanes in white, cream and tan make a delightful statement. There is even a vintage style cardboard plane for boys with high flying imaginations. Get some fabulous ideas for a great Disney Planes-themed party at this celebration inspired by Disney’s Planes 2. Plan an awesome airplane-themed party with these great resources gathered by the flight crew at Spaceships and Laser Beams. 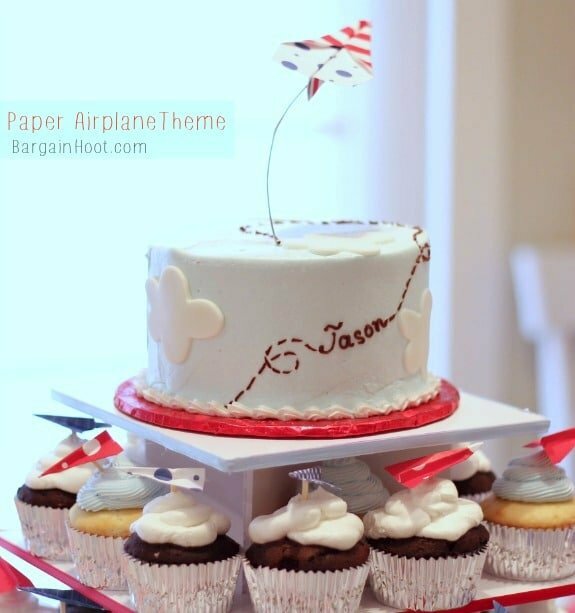 Check out these great ideas for more airplane themed fun.